Cambridge City Councillors rejected Tesco’s application to sell alcohol in their new Mill Road store. City Council rules forbid photography at meetings without permission so this photograph was not taken during the meeting. On the the 17th of August 2009 I observed a Cambridge City Council licensing committee comprising Cllr Benstead, Cllr McGovern and Cllr Dixon (Chairing) turn down an application from Tesco for a licence to sell alcohol in their new store on Mill Road. The meeting started at 10am, I tweeted the result at just after 14.00, as soon as it was announced. Tesco was represented by their solicitor Mr Bark, the store manager for Mill Road, Terry Barker, and Greg Bartley the UK Licensing Manager for Tesco Stores Ltd. The police appeared to be taking their opposition impressively seriously, their team was led by leading counsel Jeremy Phillips; an individual with the presence, attitude, tone and appearance of a barrister. Mr Phillips was accompanied by a solicitor from Weightmans who introduced herself as representing the chief constable – but took a couple of attempts to remember which force’s chief constable it was she was representing. A number of committee managers and other staff from Cambridge City Council were present, along with two legal advisors acting on behalf of the council. The council’s licensing manager was there to introduce the officer’s report on the item. About ten individuals spoke as “interested parties”, these included three councillors City Councillors Bradnack and Smart along with County Councillor Tariq Sadiq. These councillors all spoke only to speak on behalf of specific, named, constituents who had asked them to “re-present” their views to the committee. It appears that they were not able to act as elected councillors and represent the views of all their constituents and generally act as I would expect a councillor to. Cllr Chris Howell observed, but did not participate, apparantly due to the restrictions on the role councillors can play. I understand councillors not wishing to do anything which could give rise to an appeal and result in costs to the council, but I would like to see councillors free to act as effective representatives at planning and licensing committees; the current procedures, or their interpretation of them prevent them from doing so. City Councillors Baker, Ward and Rosenstiel also observed for part of the proceedings. In addition to those speaking, a further twenty five or so members of the public attended. The proceedings started with the chair, Cllr Dixon, explaining that those councillors who were members of the committee were: “acting not on behalf of our constituents but on behalf of the law”. Instead of their usual place names which are coloured according to party allegiances all three were given black and white labels for the licensing committee. Personally I think the whole point of having councillors consider license applications is to ensure that they do take into account the concerns and views of residents. Certainly if the electorate disagrees with their decisions over a term of office they can be voted out, so to suggest they have no regard to the views of constituents and residents of the city makes no sense. In respect of those members who support the cumulative impact zone policy on Mill Road – or who belong to parties which support that – they have a clear interest in ensuring that policy which they have put in place has an effect. Just before the proceedings themselves got underway, Cllr McGovern declared a personal and non-prejudicial interest as a member of the Campaign for Real Ale. The council’s licensing officer kicked things off by summarising her report, she referred to the council’s “special policy on cumulative impact” and said that according to that policy the assumption was that a licence would be refused, unless the applicants demonstrate no negative cumulative impact on the licensing objectives. She said that the hearing was only being held due to the fact there had been representations from police and other responsible authorities. She reported that there had been 123 representations from interested parties, of which two had been in support; the petition was also mentioned. There were a few from outside the area, a few without addresses given and residents of fifty-four different streets had made representations. The council officer stressed that planning and licensing regimes are different matters. It would normally not be justifiable to adopt a special policy on the basis of a concentration of shops, stores or supermarkets selling alcohol for consumption off the premises. Special policies will usually address the impact of a concentration of licensed premises selling alcohol for consumption on the premises. He noted that there was no mention of off-licenses or supermarkets in the council’s policy and that the council adopted its policy on the basis of evidence from the police which also contained no reference to off-licenses. He pointed out that it would be usual, if going against government guidance, to be quite clear that was what you are doing. Tesco’s put forward the view that the guidance to the act was intended to make clear what Parliament’s intent was when it passed the legislation allowing cumulative impact zones. Given the outcome, it appears that councillors were aware of the reasons why the cumulative impact zone on Mill Road is in place – and that it is very much intended to refer to shops selling alcohol; this is one advantage of having councillors determine the application determined by them. In the first indication that Tesco were concerned about not getting their licence they made a concession and reduced the hours they were seeking to 10am to 10pm. The Tesco solicitor then drew attention to how big Tesco is, and said that was important as they had experience of operating in very challenging locations such as Brighton and Blackpool. Later he confirmed that in those cities Tesco operated stores in cumulative impact zones. He boasted that Tesco already had a store in Brighton, in a cumulative impact zone which was specifically intended to tackle off-licences. He said Tesco was used to operating in areas with lots of street drinking, or with other challenges such as schools nearby. He claimed the company had a good relationship with the Association of Chief Police Officers. The committee was told that the Mill Road store would become one of the smallest in Tesco’s estate and would only stock a small range of products. The committee was told that 7-8% of the store’s takings would be expected to relate to alcohol. The committee was told that Tesco managers always back up members of front line staff if they decide to refuse sale of alcohol – even if management think the front line staff have made the wrong judgement. “Always always always” said Tesco’s solicitor. Pointing to the plan of the new store, it was pointed out that the Manager’s desk is to be right in the store by the checkouts, and not in a separate office. He also said the store would sell nothing in smaller quantities than 1/2 a bottle of wine, and if 330 ml cans were sold it would be only in a four-pack. A Challenge 25 scheme shall operate at the premises. All staff will be trained and refreshed on the Challenge 25 policy. Training will be recorded and made available for inspection on request of enforcement authority. Challenge 25 notices will be displayed in prominent positions throughout the premises. Sales of alcohol will always be processed through the store’s tills which will be programmed so that a prompt will appear reminding the cashier on their responsibilities to ensure they sell alcohol legally and of the company’s Challenge 25 scheme. The cashier will have to respond to the till prompt to affirm and continue with any sale of alcohol. No display of alcohol shall be located within 3 meters of the entrance / exit of the premises. Ordinarily, there shall be a minimum of 2 personal licence holders based at and employed from the store. Ordinarily, a security guard shall be shall be employed at the store during the hours when licensable activity takes place. On police request, the store to provide contact details of any member of staff, including any external security guard employed at the store. A CCTV system will be operated within the premises and images will be retained for a minimum of 31 days and made available to the police or licensing authority upon reasonable request. No beer, cider and larger [sic] with an abv of over 5.5% shall be sold from these premises unless the prior written consent of the Police has been obtained. A maximum 10% of the trading area of the store shall be used for the display of alcohol at any one time. The hours for the sale of alcohol shall be between 10am and 10pm on any day. The committee was told that due to the presence of vagrants on the street and dependency units nearby Tesco were prepared to accept a no beer, cider and lager with an abv of over 5.5% without written consent condition. Tesco stated that White Lightening would be excluded under this condition. With respect to the area of the store devoted to alcohol, the committee was told that 4.2% would be normal, and Tesco stressed alcohol was not the focus of the store. The police’s representative was able to ask questions of Tesco. He tried to direct his questions at the store manager, rather than the solicitor who had been leading the presentation of Tesco’s case, however Tesco’s solicitor responded. The police said that a survey of small shops in Cambridge had been carried out and they found eight out of ten items to be cheapest in Tesco. Tesco complained that that statistic wasn’t in the police’s written submission so couldn’t comment directly on it. Tesco then then tried to argue both that their products were excellent value, but that they weren’t “cheap”. Interestingly Tesco’s solicitor rarely spoke of cider and lager while talking. In reference to the survey he talked of “those eight wines”, and at one point he even described the shop’s potential alcohol stocks as “wines and champagnes”. Tesco’s plan of the store reveals that the area is classified as : “Affluence : up market”. I had made a freedom of information request in advance of the meeting for the police representation. It appears that the information I was offered was woefully incomplete, as the police had in fact submitted a number of written statements, including one from Sergeant Cross, who leads the neighborhood policing team in the area. They had also produced crime maps of the area, going back a number of years and had also provided information on where people who’d ended up in A&E were injured. The police noted that, in this division, they do not object lightly to licence applications. They said it was wrong to make any distinction between the effects of on, or off licences on Mill Road. The police made clear that it “certainly was the case that the Mill Road cumulative impact zone designation was based substantially on the licensing of off-licenses in that area”. I have published the key element of the police case previously. They summarised by saying: “the granting of a licence can only exacerbate the relatively serious public order problems the police have to deal with on a daily basis in the area”. Apparently under the impression he was in court the police’s representative then went on to say: “Can I please call Inspector Marcia Nichols … you are currently serving in Parkside police station in Cambridge I believe, and have been a serving police officer since 1994. …” He then instructed her, followed by Sgt. Cross – who he introduced as “Sergent 153 Divisional Sergent, who has worked on Mill Road since 1985″ to read out their statements. Both Sgt. Cross, and another police officer, PC Sinclair the force’s licensing constable were present in uniform (white shirts, no visible armor, weapons, radios etc. ). Sgt. Cross said he was anxious that a new licence doesn’t destroy the progress which has been made in the area, he explained there had been a number of prosecutions of off-licenses for selling alcohol to drunks, and pointed out that such prosecutions were very difficult and expensive for the police independent collaboration as well as the evidence of a police officer was required. He said there had also been prosecutions for alcohol sales to children. The fact the section 30 dispersal zone which covers the area has been renewed every six months since 2004 was raised, and Sgt Cross reported there had been a number of “Mill Road specific Anti Social Behaviour Orders issued”. He said the city council’s needle collection stats demonstrated drug use in the area, and said that those waiting for appointments at the Mill Road / Brooklands Hospital site (until a change of contract) attracted people to the area and dealers were dealing to that group. He stressed his comments on the group were based on their behaviour and not their appearance or housing status. Cllr McGovern asked about the timing of problems on Mill Road, and what the police’s view was on reducing the hours of the licence. The police responded to say that street drinking starts when street drinkers get up, which they said was 7-8am. As many are in hostel accommodation and have to be in at a certain time it doesn’t extend too late – beyond 7-8pm and the police said many are incapable of walking very far by that time anyway. The police stressed the problems start very early – as children are walking to school. The police said : “Mill Road is still a social meeting place with easy access to alcohol and heroin”, despite the lengths that police authorities, the police the council and others have gone to to deal with the situation. Cllr Dixon asked about the peak in offences between 10pm and 2am, he suggested and the police confirmed that these were not due to the same people who were drinking on the street. The police said these were more likely to be violent offences, and pointed out the later crimes were more likely to be of the kind needing a police response, where as street drinking was generally a low level, but constant problem, and not one people would generally call the police about. Inspector Marcia Nichols didn’t say much, but councillors did find what she said inconsistent with elements of the police’s written submission on one hand they were being told anti-social behaviour was rising and on the other it was falling. The inspector explained the apparent contradiction as being due to a decrease in the number of reported cases of street drinking – she said this was likely to be down to effective partnership working, however despite that she said street drinking was still there and still a problem. When I heard this from the police inspector the only way I could rationalise it was if the police efforts have been focused on deterring people reporting problems, and that has, in the eyes of the inspector worked, as the number of reports are down; however that isn’t so useful for the police when they’re objecting to a licensing application so they then reveal the problem is still there, despite their statistics not recording it. A key part of Cambridge police’s strategy appears to me to be deterring people from reporting crime; I don’t think that’s a useful strategy. I don’t want to be too critical as clearly the police, and their legal team are stars of the show today – they’ve helped uphold a democratically arrived at policy for the cumulative impact zone and ensure it is effective. The members of the public spoke next. First up was Ruth Deyermond who spoke on her own behalf, and on behalf of the No Mill Road Tesco campaign and a list of various others, including David Vincent who is a regular commenter on my articles here. She quoted extensively from Mr Vincent’s comments, stressing Mill Road was still the site of two drug / alcohol treatment centres, and that the new store would provide street drinkers with a perfect environment with a cashpoint and a space between the road and the shop ideal for accosting begging targets. Ruth Deyermond claimed that the fraction of the store to be given over to alcohol had increased as Tesco had re-drawn its plans to accommodate the smaller store it was left with following the rejection of its application for planning permission for an extension. 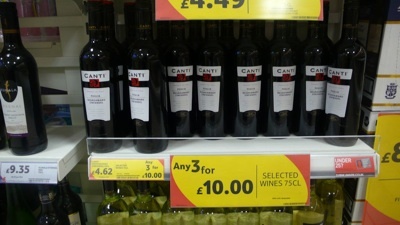 She said: “As the store has shrunk, there has been a greater emphasis on alcohol”, she also criticised Tesco for using “percentage of floor area” as their chosen unit saying it is not that but percentage of shelf space which is important, and the latter she calculated would result in a figure of 12% alcohol. Ruth Deyermond pointed out the astonishing fact that Tesco had not addressed the cumulative impact zone in its application or operating schedule. She pointed out the relevant individuals from Tesco were well aware of the existence of the zone as she and others had mentioned it during the planning inquiry. She also criticised the “template” nature of aspects of Tesco’s submission. The committee’s attention was drawn to problems at the Tesco express on Chesterton High Street as quotes from the North Neighbourhood Profile document prepared by the police were read out. When the committee were told by residents that Tesco express stores in Brighton and Blackpool had had their alcohol licenses removed due to under-age sales Cllr Benstead’s eyebrows almost hit the ceiling. Brighton and Blackpool were areas cited by Tesco as places they had successfully run stores in difficult environments. Amazingly, given the fact Tesco had only produced their list of proposed conditions at the meeting, Ruth Deyermond was able to quote a number of products which would come under the 5.5% cut-off proposed, including Stella at 5% and Strongbow at 5.3%. Janette Everey introduced herself as an Argyle Street resident, a parent of a baby – who she brought along, and said she was a teacher at St Philips School on Vinery Road. She said her objection was on the grounds of protecting children from harm. She described seeing the effects of living in an area where there is street drinking by saying that just today on Argyle Street there were three smashed bottles and one lot of vomit. As a teacher, she said children complain about the street drinking around the area. She also said that each class in the school goes on a trip into the local area once a month, and during those trips street drinkers were disturbing for children and difficult for the adults with them to deal with. She said that children were taught personal social and health education but what they were taught was undermined by what they see around them. She finished by saying: “We don’t need another shop which sells alcohol in a cumulative impact zone”. Mr Cambpell relayed his own frequent experiences of being harassed by youths asking him to buy alcohol for them. Mr Moggs spoke on behalf of his family, 6 children and 7 grandchildren; he lives on Collier Road. He said that Mill Road residents were a tolerant bunch who didn’t want to bother the police over minor matters, but that there were real problems at all times of the day. He said his son had been cut by a drunk man wielding a bottle on Mill Road, “and all that entailed”. With respect to Tesco he questioned their real commitment to responsibility given the fact that they do sell things cheaply; he said the council would have no powers to stop them from offering cheap sale prices; saying that some of the cheapest prices for alcohol come from Tesco – 14p per unit he quoted – saying this was highly irresponsible. Pointing out that most street drinkers look over forty – so the challenge 25 policy won’t make much difference, and saying again as many had done that the problems in the area are all day so offering to reduce hours won’t help Claire Milligan said that Tesco had not demonstrated that they were not going to make the situation on Mill Road worse. Adding: “Yet we’re here in a licensing hearing”. The problems associated with begging were raised again, and a feeling that problems are getting worse relayed to councillors. Mr Freeman said he had lived on Hope Street for 30 years. He noted that according to Tesco’s plans they were not proposing to sell any fine wine in their new store – the internal layout plan gave the number of fine wine shelves as zero. He said lots of beer and lager would be sold – and an awful lot at that – based on the figures Tesco had given earlier. Cllr Bradnack said he was not speaking on his own behalf, or as a councillor, but simply on behalf of some people who had asked him to speak on their behalf. Martin Lucas-Smith, who was one of those whose views he was presenting, had written to say that approving this licence would make a “total mockery” of the long process of obtaining the cumulative impact zone. He had also reported, and provided photographs of, deals such as 3 bottles of wine for £10 in Tesco at Cambridge Leisure and half price wine on sale in a One Stop shop in the city. According to One Stop’s website: “Tesco plc acquired T&S Stores and the company continues to trade under the One Stop brand”, however the Tesco representative said: “One stop are an entirely separate company, unrelated to Tesco retail stores”, and objected to photographs of the One-Stop shop’s advertising being submitted to the committee; the committee’s chair didn’t allow too much debate on the admissibility of the photos on the grounds the point had already been made without them. Tesco had not responded to the council’s suggestion that they obtain a lawful development certificate. Apparently Tesco had merely stated they were not prepared to go down that route, and the council had not pursued the matter. The council’s (presumably very expensive) legal advisor made her only contribution to this part of the meeting by summarily stating, without giving any reasons, that the point was not relevant. 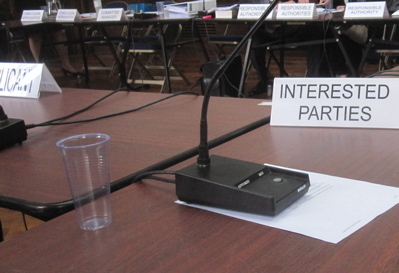 The meeting’s chair concurred saying “Planning cannot be taken into account”. Tesco’s representative said: “We believe we have lawful planning approval on that site”, and the proceedings moved on. I feel that this significant point was not adequately addressed. Mr Lucas-Smith has asked me to make clear that his representation was made as an individual, and not on behalf of any other organisation he is involved with. Cllr Sadiq spoke on behalf of a local resident citing many of the reasons which had already been put. Cllr Smart spoke on behalf of a number of people, her only novel point was that she thought the guidance on Cumulative Impact Zones suggested that new licenses ought only be granted within them if a new and different offering was to be made. She said there was nothing being offered by Tesco which could not already be obtained from a number of other places within a stones throw of the premises. I’m not suggesting Cllrs Smart and Sadiq didn’t do an excellent job of representing their residents, I’m just avoiding repetition by not noting down arguments already made. While we are very competitive, I would not say we were cheap. In a final act of desperation he offered another new condition – that there would be no external advertising of alcohol, or advertising of alcohol in the windows. The committee, and their legal advisors, left the room to deliberate. On their return their chair, Cllr Dixon, announced that they had refused the application for a licence. He read out a brief statement of their reasons, which in essence were that that the decision to reject the application had been made in light of the council’s cumulative impact zone policy, and that the police’s arguments had persuaded them that there were real problems on Mill Road, which had the potential to get worse if the new licence was granted, and Tesco had not done enough to convince councillors that their presence would not make things worse. Cllr Dixon also made clear that not all the views and opinions which has been heard had been deemed relevant by the committee. He made clear that comments on planning had been ignored. The council has a special policy on cumulative impact for Mill Road. Evidence presented by the Police showed that the effects of the problems on Mill Road last all day. The Applicant (Tesco) didn’t show sufficient evidence that they would address these issues, especially with regards to Public Safety and Prevention of Crime and Disorder. Any party can appeal against the decision of the licensing committee, in which case a whole new hearing is held in-front of Magistrates (or maybe a district Judge). Cambridge City Council are wary of licensing appeals as in 2007 the council lost an appeal the police had brought against the awarding of a licence to Wetherspoons and the Magistrates made the City Council and Weatherspoons pay the police’s costs. The unelected and unaccountable magistrates were also critical of elected councillors for failing to act on the advice of their solicitor. Some were expecting Tesco to lodge an appeal on the afternoon of their rejection by city councillors. I am happy to incorporate any additions or corrections, especially relating to people’s names if I’ve got those wrong. This entry was tagged Mill Road, Tesco on August 17, 2009 by Richard Taylor. I’m intrigued to see what happens when the shop opens…. Thanks for the report, Richard. I’m pleased to hear that Ruth put forward my representations so effectively. I wish now I hadn’t suggested Tesco might reduce the hours to 10 – 10 (their usual tactic is to offer to reduce to 8-11). The offers they are making to accept so many conditions clearly demonstrate their concerns. It is also instructive to get a feel for the type of store Tesco are looking at. So much for the old people of Romsey being offered a source of cheap groceries locally (which I never believed for a moment anyway). They are aiming to tap into the “affluent” market – maybe Limoncello should worry more than Londis. Does anyone know whether magistrates operate as a full rehearing of the application, or simply to consider whether there were any legal errors in the committee’s decision (which appears very solid on the basis of what you say). I’ve just followed your link referring to the Police appeal on the Wetherspoons\Cattle Market licence case. Fascinating. And the Police are using the same legal team here, I see. I am not sure what the implications are (other than that both the Police and the Council may be covered against having the meet Tesco’s costs on appeal) as to the nature of the hearing. It seems to be very much a hybrid. But it is of note to see that it took six months to get to the appeal. I am not convinced the Police are as committed to opposing this one as they were to fighting Wetherspoons, but let’s hope so. In a little more detail, if anyone’s interested: The original floor plan for a shop with extension and external plant indicated that 6.5% of mods (units of shelf space, essentially) were set aside for alcohol; the first revision of the plan, for no extension but external plant kept the same number of alcohol mods but in a smaller space, so it rose to just over 9%; the plan submitted with the alcohol licence application actually increased the number of alcohol mods, bringing them to just over 12% of the total. To do this after the introduction of a cumulative impact zone is grossly irresponsible. I assume they thought that no-one would notice. Incidentally, I got the strong impression that the police are very firmly committed to fighting this if there’s an appeal (which I assume there will be). I would have thought that Tesco are on very weak ground if their wild over-interpretation of section 13.33 of the Section 182 guidance is really the best they’ve got – and to judge from yesterday it is. Correction: “He tried to direct his questions at the store manager” – he was directing his questions at Greg Bartley, the UK Licensing Manager. Also, with regards to licencing vs planning (although I don’t have a reference to hand), licencing applications may be processed and considered before planning applications have been decided, or even applied for. See the China Inn, in East Chesterton for example. So to say that planning permission is required before hand isn’t quite accurate. 9.4 of http://www.cambridge.gov.uk/public/docs/Statement%20of%20licensing%20policy.pdf seems to refer to this. There are two types of committee in local government, scruitiny and regulatory. The scrutiny committees are able (quite freely) to do the represent the residents role. However, the job of the regulatory committees are to serve in a quasi-judicial role. This includes things like planning, licencing, employee appeals, standards etc. In these, you are there to act impartially and consider the case in front of you. As an example, licencing used to be a function of the magistrates court. It’s just that now councillors perform this role. I hope this helps explain how there’s more than one different role of a councillor with regard to committees. David Vincent: As I understand it, it’s a re-hearing of the case. The question of costs are then decided based on the committee. ie: If the magistrate thought the decision was reasonable in the circumstances, there’s no costs, but the decision could be reversed. Many thanks for your updates and comments, given your position they’re very valuable. I fully understand the current view of a councillor’s role in planning and licensing as quasi-judicial; but it’s a state of affairs I (and many councillors) disagree with. I think councillors ought be free to represent their constituents, and do what their constituents expect of them ie. represent their interests. With respect to the magistrates – In Cambridge – we have precedent from the Weatherspoons case which was effectively a re-hearing; however elsewhere in the country an appeal is more focused on the reasons for the appeal eg. the new evidence, the flaw in the process, or whatever it is that’s brought up. The magistrates court essentially operates in secret (though the doors are technically open) the only way the general public will learn of an appeal is if someone decides to tell us. This is an unacceptable state of affairs. Scheduled cases ought be published online; even if you go into court the notices outside are not particularly informative – they appear mainly intended to ensure the defendant and solicitors can find the right room. Yes, from what I can tell it does seem to be a rehearing of the case. I am not clear whether this means that objectors cannot introduce new arguments (whilst presumably Tesco can?). I presume that those who made objections (such as myself) will at least be given notice of any appeal hearing. I am hopeful that if the Police maintain their strong opposition, magistrates will support that stance (I doubt they will take that much notice of residents). The conditions Tesco were willing to accept certainly went further than any I’ve seen them volunteer elsewhere, so it seems they (belatedly) recognise the extreme weakness of their position. Of course, even if it is refused again, if they do manage to open and operate the store in some form (delivery by transit van, perhaps), we can expect these applications (and appeals) to become an annual event (at least). Jeremy Bark must make large amounts of money from these hearings(even if he finds it hard to remember which part of the country he is in from day to day). Whether the Cambridge community has the stamina to outlast Tesco will presumably depend on what losses Tesco are willing to accept. They are certainly used to using the steamroller approach (application after application, appeal after appeal, persistent ignoring of conditions) but in the end they are driven entirely by profitablility, rather than principle. All of the conditions offered in the Mill Road case except for conditions 4, 10 and 11 appear here, and a more stringent version of condition 4 – 10m not 3m from entrance – was introduced at the hearing (p.6 of the Nottingham document). The only distinctive condition in the MIll Road case is condition 10. Given that I heard Mr Bark say that 4% of the trading area of the store was currently set aside for alcohol display, and given that this is equivalent to over 12% of mods, a condition limiting alcohol display to “no more than 10%” of the store’s trading area would allow them to use over 30% of the shelf space in the shop for alcohol sales. Not a great concession in a CIZ, really. I must say I hadn’t come across a willingness to limit alcohol sales to 10 am to 8 pm before, or to have no window advertising, but I didn’t probe that far. I would fully expect any conditions offered to be broken, of course. The limitation on space is always debatable. Assuming they do open, in some form, it will be harder to hide behind proposed %age figures and interesting to ask at future hearings which products they intend to stop selling and which precise shelves they will clear to make way for alcohol. 1. The special policy relating to cumulative impact applies to all licensed premises in Mill Road. 2. The police evidence that there is a cumulative impact problem throughout the day. 3. There is a rebuttable presumption that applications for new premises licences will normally be refused, following representation, unless the applicant can demonstrate in their operating schedule that there will be no negative cumulative impact on one or more of the licensing objectives. 4. The applicants did not demonstrate that they would promote the licensing objectives and did not adequately address the cumulative impact policy. The applicant did not adequately address in its operating schedule or at the hearing the cumulative impact policy and its rebuttable presumption of refusal. Although clearly written by lawyers, with a view to defending any appeal, that does seem to leave an extremely large hole through which a future application can be driven, accompanied by a more detailed operating schedule etc. It was obviously a very lazy initial application by Tesco, which seems daft given the amount of energy and money they are expending on opening this relatively modest store. I assume the next one will be better.